(Not SCD Legal) This high-potency, hypoallergenic blend of 4 Lactobacillus species and 4 Bifidobacterium species is designed to safely meet the metabolic and intestinal support needs of infants up to the age of 2 years. All Lactobacillus species in GI ProInfant™ Infant Formula produce only L(+)-lactic acid that can be safely metabolized by infants. An infant’s gastrointestinal tract is not fully mature at birth and cannot metabolize the D(-) isomer of lactic acid produced by many lactobacilli. Each species in GI ProInfant™ Formula has been selected based on the scientific literature documenting its safety and crucial importance to the normal development of an infant’s gastrointestinal and immune systems. GI ProInfant™ Formula is designed to support a normal infant microflora that can be easily disrupted by cesarean section delivery, formula feedings, antibiotics, toxin exposures, and a maternal diet lacking in fresh fruits and vegetables. 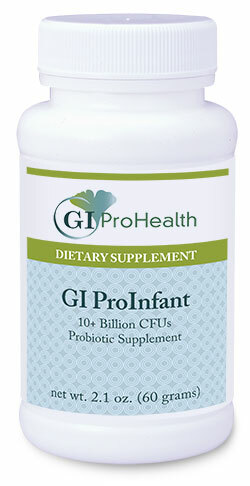 GI ProInfant™ Formula is available in a high potency powder providing 10+ billion CFUs per 1/4 teaspoon. GI ProInfant™ Formula powder can be mixed with expressed breast milk, formula, or solid food at room temperature as appropriate. GI ProInfant™ Formula uses a proprietary technology to deliver a maximal number of live microorganisms to the intestines. Specific Bifidobacterium species are normally predominant in an infant’s gut microflora and constitute 95% of the anaerobic bacteria cultured from the stool of healthy, breast-fed infants. GI ProInfant™ Formula contains species that are appropriate to an infant’s gastrointestinal tract. Bifidobacteria ferment an array of oligosaccharides including those found in breast milk generating the vital short-chain fatty acids such as butyrate, which are essential to healthy colon maturation and function. 1. Up to what age is GI ProInfant™ recommended ? GI ProInfant™is made for children up to two years of age. 2. Does GI ProInfant™ have to be mixed with food? It should be mixed with room temperature or cold food or drinks. 3.Can GI ProInfant™ be mixed with breast milk or infant formula? Yes it can be mixed with both breast milk and infant formula as long as they are room temperature. 4. Can GI ProInfant™be mixed with hot foods or drinks? No it can not be mixed with any hot food or drinks. When administering a dose to a child it should be with room temperature foods or drinks as anything hot would kill Its’ active cultures. 5. How much is the recommended daily dosage? ¼ Teaspoon per day is the recommended dosage. 6. How many CFUs in a ¼ teaspooon? 7.Is GI ProInfant™ considered a probiotic? Yes GI ProInfant™ is considered a probiotic. 8. Does it have to be refrigerated? Yes because it is a probiotic is must be refrigerated to maintain its active cultures..
9. If not kept refrigerated will the active cultures die? GI ProInfant™ Can be kept out of the refrigerator for up to two weeks if the temperature does not exceed 65F. The warmer the temperature gets the shorter the time span it can stay out of the fridge. 10. How long is the shelf life of GI ProInfant™ if kept refrigerated? 6 to 9 months if kept refrigerated and all bottles have an expiration date on the bottom of bottle. 11. Is GI ProInfant™ a “SCD Legal” product? No it is not a “SCD Legal” product.